beer lost its place within the culture of the city. Being such an important part of the history of Montreal, the brand wanted to showcase the cultural heritage of the city as it celebrated its 375th anniversary and to acknowledge its retailers and customers that had been loyal to the brand for decades. The challenge was to reinvigorate love for a brand that’s been absent in the market for years. The question was, how can Export ingratiate itself to the city when their biggest fans feel like the brand abandoned them? Molson Export was an inextricable part of Montreal’s coming of age: a time that’s burned into the imaginations of its drinkers. Molson Export is a brand born and beloved in Quebec, Canada’s French speaking province. Its drinkers are proud Quebecois (71% of which are over 45, working class and drink more than 7 beers a week), who came of age during Quebec’s golden era during the 1970s and 1980s. During this time, Montreal was the largest city in Canada and its cultural and economic hub. The distinct aesthetic from this era could be used in conjunction with the relaunch of the 70’s era stubby bottle to reclaim Export’s rightful place within Montreal’s cultural establishment. The idea was to transform points of sale into cultural institutions. Like most big cities around the world, Montreal has convenience stores, known locally as dépanneurs. Montrealers see them as far more than a corner store where they can get their daily provisions. They are part of the culture of the city. Located in the heart of every neighbourhood, they serve as a vital hub for the local community. Though Montrealers hold them close to their hearts, several of these dépanneurs were in a state of disrepair. In fact, the independent owners had all kept the same storefronts from when they had opened, which clashed with the rest of the urban environment. So the team decided to give 25 of these retail spaces a welcome refresh. Dépanneurs are not only the best brand ambassadors for the brand’s target market but they are also the place of choice for buying beer in Montreal. Before, their dilapidated and neglected look was an urban eyesore, at odds with their importance in the life of Montreal neighbourhoods. The goal was to make the Molson Export brand naturally visible among its most loyal customers in key points of sale for years to come. The plan was to collaborate with independent store owners to customize their storefronts into something their neighbourhood could be proud of. For more than six months, the team’s design, architecture and production teams developed a complete remodelling plan for each of the 25 revamped dépanneurs in the city of Montreal. Custom- designed shop signs were made for each point of sale, and the buildings themselves were refurbished with new elements and structures. The materials for the shop signs were chosen based on their durability and respect for artisanal traditions. The signage was made mostly of neon lights, thermoforming and light boxes. What’s more, every element of signage respected the architecture and heritage of the dépanneur in question. The brand was soon ingrained into the fabric of the city. With no media placement whatsoever, the new storefronts themselves will garner a total of 259 million impressions over calendar 2018, for an equivalent media value of $840,000. Given that these storefronts will remain in place for a minimum of five years, at least 1.3 billion impressions are expected through the end of 2022. Since most of the storefronts are expected to remain untouched for many more years after that, these numbers are conservative projections. 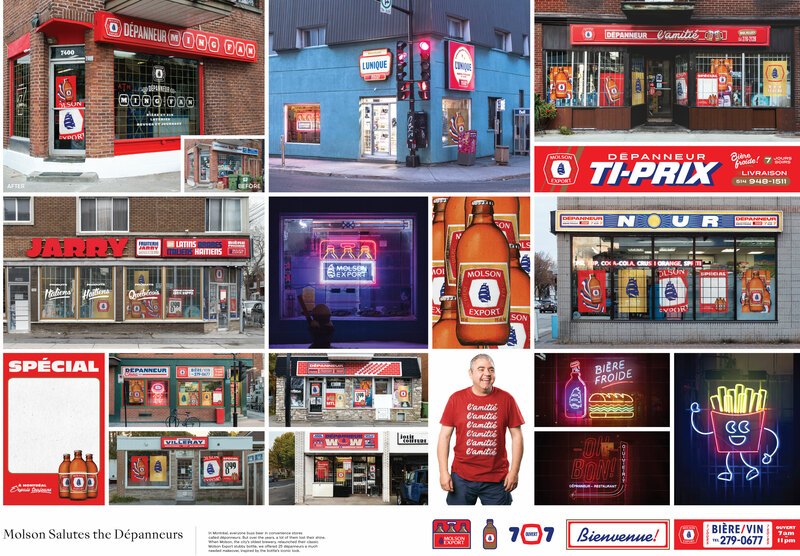 In addition to the limited edition Molson Export quickly selling out, dépanneurs with the new storefronts increased their sales by 18.8% over the next three months and 84.8% in the month immediately following the launch. Media at the time of launch exceeded 1.3 million owned social impressions, and over 10 million earned traditional impressions, for a combined impression that is equivalent to almost twice the population of Quebec.